There are a few annual to-dos that can inspire stress and panic among HR professionals: performance reviews, year-end payroll, and of course, open enrollment. As you strive to improve employee happiness, a compelling benefits package is a critical piece of the puzzle. And open enrollment is the moment when employees engage with all of benefits options you’ve been working hard to secure behind-the-scenes. When you get those final employee selections over to your carrier, it’s time to breathe a major sigh of relief. But how do your employees feel about the process? And what do they really want from you in terms of guidance, time, and support? We set out to answer those questions in a survey of over 500 respondents. 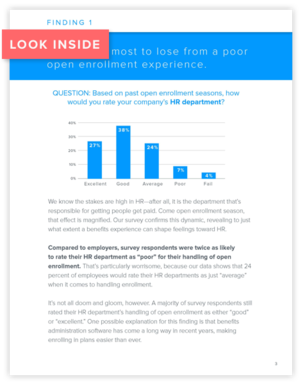 * It turns out, there’s some room for improvement: 31% of employees give their employer a “C” or lower when it comes to open enrollment.